We are well positioned in both developing and developed markets. As the largest pharmaceutical company in Africa, we have an expanding presence in Latin America, Asia, Europe and the Commonwealth of Independent States, comprising Russia and the former Soviet Republics (“CIS”). We are also one of the leading pharmaceutical companies in Australia and are establishing a presence in other developed markets such as the United States of America (“USA”) and Canada. With an extensive basket of products that provide treatment for a broad spectrum of acute and chronic conditions experienced throughout all stages of life, we continue to increase the number of lives benefiting from our products, reaching more than 150 countries across the world. 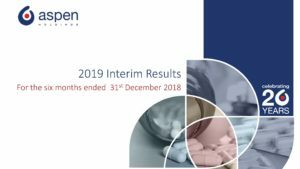 View share price information for Aspen Holdings. JSE data delayed by 15 minutes, page refreshes every 5 minutes. Indicated trade times are actual.